Car safety for children is always evolving as scientists and researchers find better, safer ways to do things. But we bet you’ve never seen an innovation in car restraint safety for babies and children quite like the Evolve from Infasecure. Just launched onto the Australian market today, Evolve is a watershed in car restraint safety for children and something that parents should get very excited about indeed. Why? Because it does away with the whole difficulty of trying to make an adult seat belt work for kids. Every other booster seat on the market requires that you use an adult seatbelt to secure your child in their seat once they hit four years old. That’s even from convertible seats with built-in harnesses. As soon as your child hits a certain size – usually around four years of age – it’s out with the inbuilt harness and in with an adult seatbelt. Not with the Evolve. 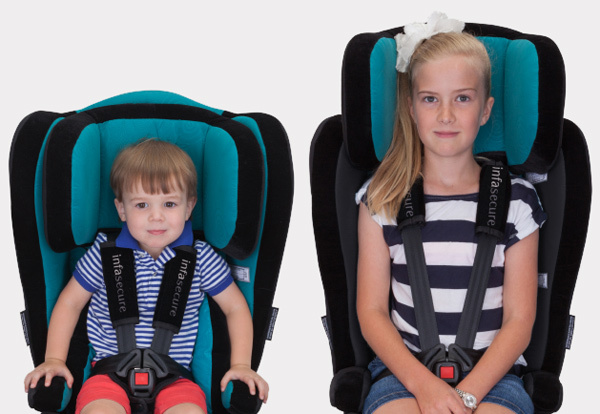 In a world-first, Infasecure has created a child car restraint that allows the inbuilt six-point harness to grow and adapt with your child, from the infant stage all the way through until the middle primary school years. That’s around eight years old. 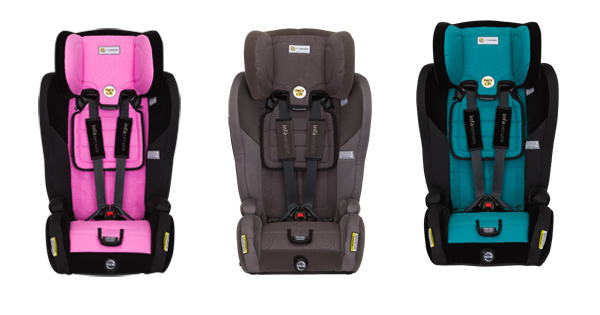 Infasecure tell us they named the new seat because it’s designed to evolve with your child, but we think it’s also because the Evolve represents an evolution in car safety for kids. Put simply, it puts an end to the “that’ll do” approach of strapping your child into a booster seat. That’s not the only innovation. The Evolve has a new exclusive Twist & Lift system that allows the headrest and harness to be adjusted with one hand from the front of the seat. In simple terms, that means it will only take seconds to adjust the Evolve and get a perfect fit for whichever child is using it, perfect for families with multiple children. The crotch buckle is also height adjustable to ensure the best fit. Now get ready to do some more parental fist-pumping because Infasecure also designed the seat with twist-resistant straps. Frustration factor aside, this is especially important when you consider that crash data from the Monash Accident Research Centre shows that almost half the straps fitted by parents were twisted, badly fitted or in the wrong position. It’s not just all about making life easier for parents. This seat is also about making car travel safer for children. In fact, the Evolve manages crash energy to the child at up to five times better than what is required by the Australian Standard. 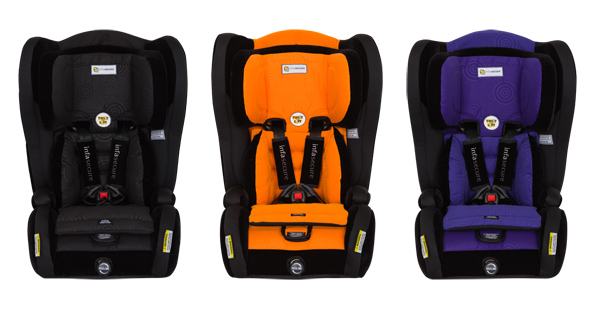 Infasecure proudly tell us the Evolve is one of the safest child restraints they’ve ever created. This may sound rather strange, but basically the Evolve keeps your child safe by cradling them in a layer of air that gives 180 degrees of protection to their vital organs if there is a crash. This Air Cocoon Technology, exclusive to Infasecure, boosts protection by injecting air into the shell of the seat during the manufacturing process. Take a look here to see how this smart child seat works. All that safety is important, but Infasecure is taking care of aesthetics too. The Evolve, with its Caprice swirl patterning, looks good and comes in eight colours, so there’s something to suit every kind of family, whether your tastes hover around neutral (hello ebony and grey) or swing to something bolder (whoah there orange, purple, pink and aqua). 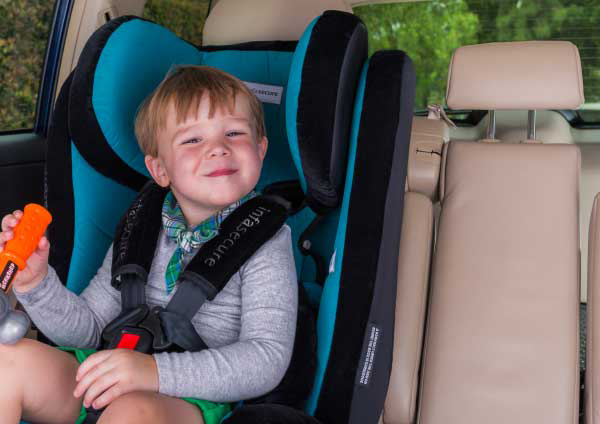 And because it’s vital for the seat to be as comfortable for the kids as it is safe, Infasecure have added a gradual recline ability, plenty of comfy, removable padding and pop-out cup holders. Nice. A world first in child car safety, and we’re so proud that it’s an Australian company leading the way. The Evolve retails for $419.99 and is available from all good baby stores across Australia. To find out more about the Evolve or for a list of stockists, visit Infasecure. You can also browse our archives for more car safety tips and products from Infasecure.